Can It Be? Another J. 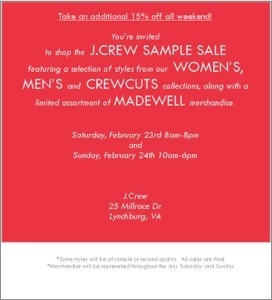 Crew Warehouse Sale Is In Our Midst! Are my eyes deceiving me? Is this too good to be true? J. Crew is opening their warehouse for shoppers yet again. Mark your calendars for next weekend! Clearly, I didn’t buy enough in January, so they had to host another sale. It’s the only plausible explanation. I will probably take a breather from this one, but I won’t stand in any of your ways! Here are the details. If you go, remember my tips from last time, and let me know what you get! Dear Discountess – Do you have to be on a list, or can you just show up? Thanks! And love the blog! You can just show up. They’ll give you a trash bag and a list, and you can begin your foraging. Good luck! Hey! Hope all is well and I’m sad I saw this too late. How did you get on the mailing list so I can plan accordingly next time? Thanks! I added my name to the mailing list when I was at the sale. They don’t have a place to do it online, unfortunately. I’ll definitely post on the blog when the next one is happening! Any chance you can let us know when the next sale is? I just heard about it through an acquaintance last week and am now dying to go! They were having them every month for a while, but I haven’t gotten an email in quite some time. Let me do some digging and see what I can find out!